The best time to go through your cold weather clothes is in early Spring, when you still remember how cold it gets. It’s easy to chuck out a great winter coat in July because snow, wind and rain are such a distant memory. If you are holding onto jumpers and coats you don’t need, use or even like there is a good chance that somebody out there really needs them. In cold weather homeless shelters are always looking for warm clothes. Has it lost it’s matching pair? Does it match or go with anything? Is it worth the hassle of mending? Can you find 5 things that fit the bill on the list? They should stand out like sore thumbs as things you really do not need to keep any longer. Take it easy, this is not a total winter wardrobe overhaul, this is a gentle dip in, dip out approach. If you find more than 5 things today that is great but do not get carried away! Don’t get rid of anything you might want to sell at a later date. Choose stuff you are happy to get rid of and say goodbye to now. And if you love it, but you are not wearing it at the moment then it’s totally fine to keep it! If you can’t bear to get rid of a favorite jumper that doesn’t fit any more have you considered upcycling it? There are lots of amazing ideas on this Pinterest board but be strict with yourself – if you are going to upcycle do it NOW, don’t add it to a pile of stuff you might never get around to. 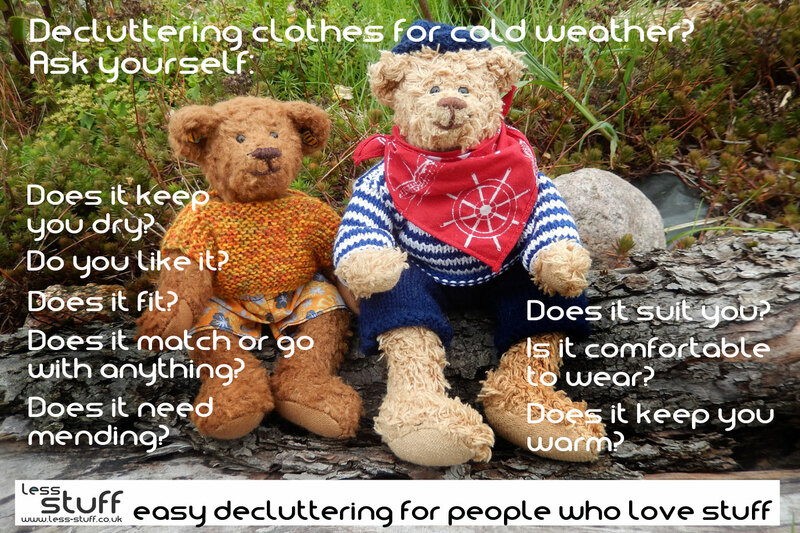 Do you pack your winter stuff away when it gets warmer? You don’t really need to be looking at thick coats on the hanger all year round. If you haven’t already, consider making space for out of season stuff in a cupboard or box. When it gets a little warmer you can pack them all away until next year. Also, it’s good fun taking the box out in the Autumn, I usually forget what I’ve put in there so it’s often a nice surprise!